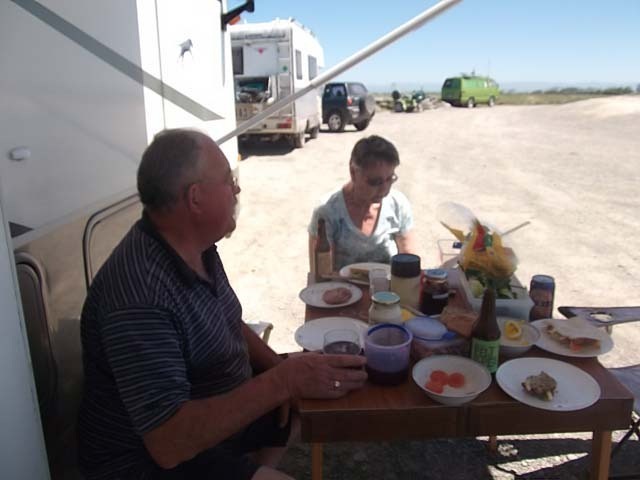 Before leaving Oamaru we managed to fit in a dinner with Burnie and Hilda and Steve and Leslie and Antony. 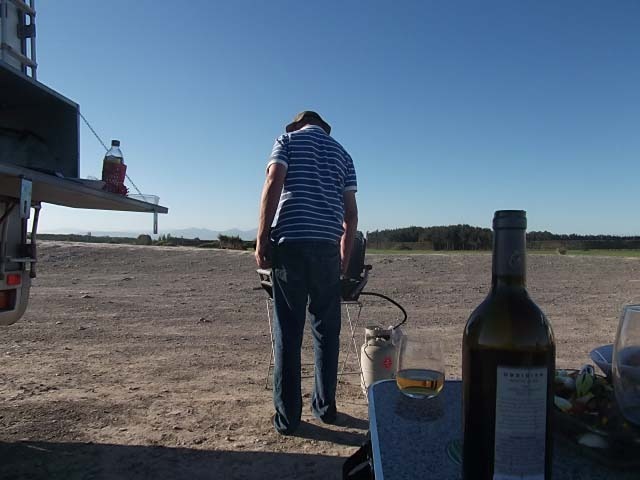 A very good barbeque, good wine and a fine evening. Christmas Eve and we leave Oamaru, this time with a passenger on board, Antony! 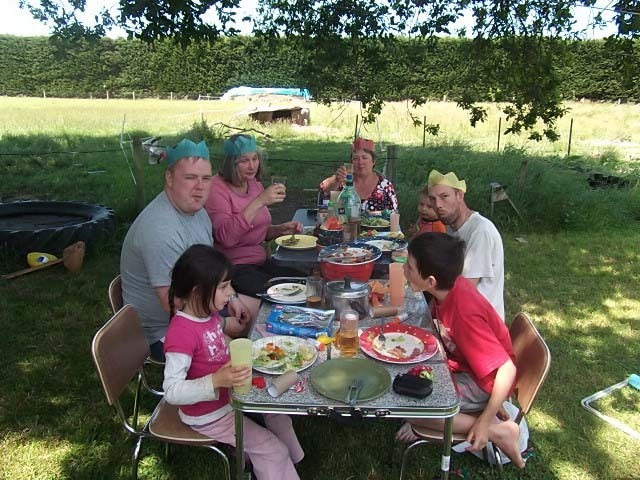 Off to Jason and Erica’s to spend Christmas with them, they live just a few km’s out of Ashburton so not a long trip. Christmas Day and the children were not awake too early, in fact Grandad was up well before anyone else. The jolly red suited man had done his bit and left behind presents for all. A lovely day was spent opening presents, playing games, and eating Christmas dinner outside under the shade of the big Oak Tree. Antony was delivered to Christchurch Airport in plenty of time for his flight home. We really did appreciate him coming down to support us through this emotional time. On our trip back to Ashburton, Roy realised that he had lost one of his hearing aids. So a short stop to check out the car, call Ants to check out the airport in case it had been knocked out whilst saying farewell, but all to no avail. Search around at Jason’s but still no luck. Heavy sigh, a call to the insurance company and a new one will have to be made. 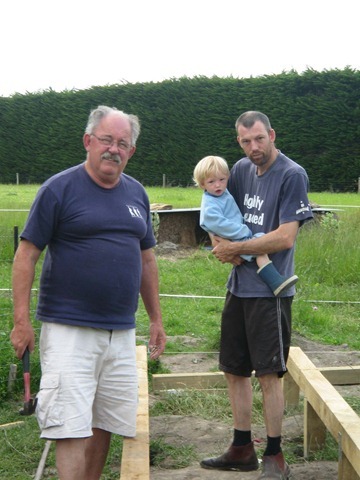 Roy is helping Jason build a shed, well, it is very amusing to watch as two Mathematicians working out levels, angles and lines is very funny…..they DO think differently to the rest of us!!!! 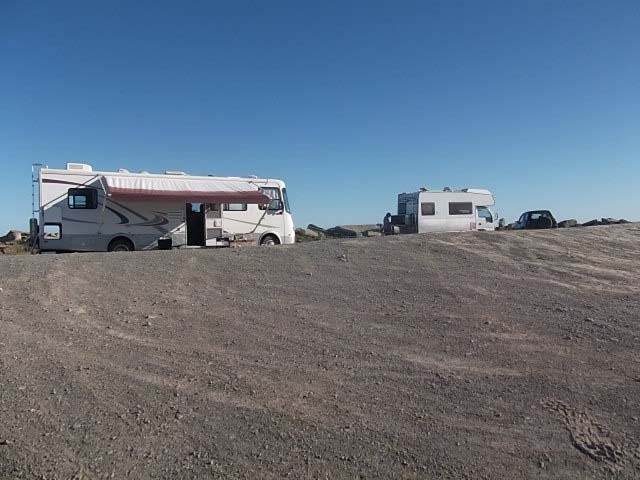 We moved from the side of the road to the Tinwald Domain and are staying here for a few days. We will remain here around Ashburton until Saturday at least, as Friday is Dante’s 8th birthday. We shall then head off for a couple of weeks, but not venturing too far as we plan to return for Rose’s 6th birthday on 12th January. Today was Dante’s birthday and he got a present that he was really looking forward to. 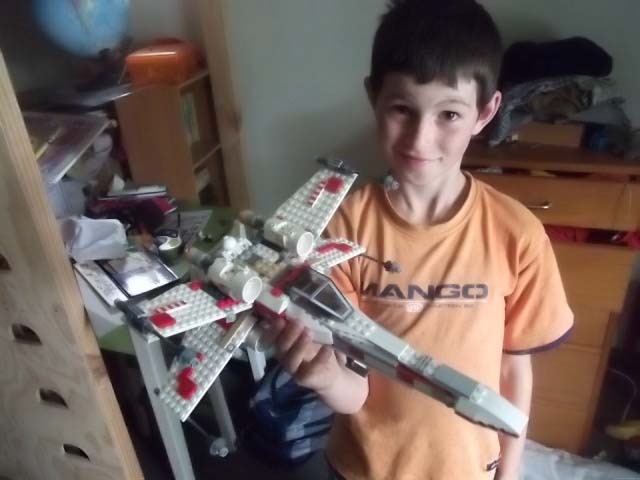 Eat your heart out Antony here is the Leggo Star Wars X-Wing Fighter as assembled by Dante. After a lovely evening spent playing cards with Anne & Paul, we arranged to meet this morning for morning tea at Art Trio which we have been told that you have to experience the excellent service offered. However, those plans were scuppered when we found that the Cafe is closed on a Monday. 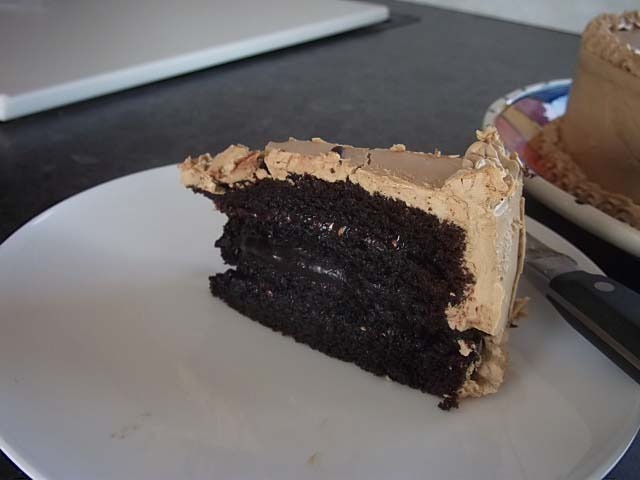 Never mind, plan B, head out to Nosh for lunch after a spot of shopping at the Lolly Shop in Waimate. 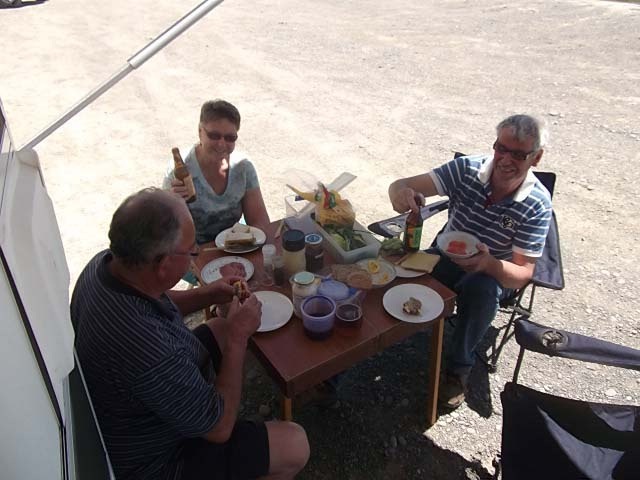 Another surprise, a lovely lunch awaited us at Nosh Cafe on SH1 at the turn off to Waimate. We all enjoyed a lovely leisurely lunch before it was time for us all to get back to the real world. As we had missed out on Art Trio, we decided to stay in Waimate another night to enjoy morning tea there tomorrow. Art Trio Cafe lived up to the reviews we had heard, they certainly know how to treat a customer, and their coffee is good too! We bade farewell to Anne & Paul, wishing Paul all the best for his heart surgery on Friday. 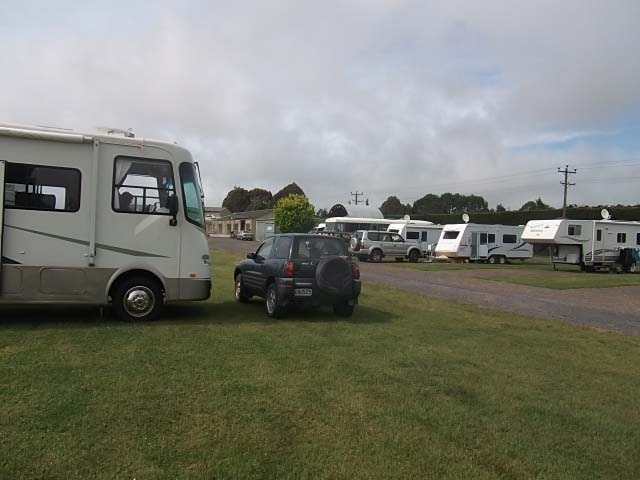 Time to head off, by this time we had heard that sister-in-law Ann was in Oamaru hospital so back to our usual position at the Oamaru Race Course. Ann was diagnosed with cancer a couple of weeks ago (the reason we returned to Oamaru earlier) and was in Oamaru hospital as her pain medication needed updating. She was home again on Wednesday and things were looking up. I had organised to use Mike & Ann’s house to cook dinner for them and for Mum & Dad. What they all did not know was that brother John and his daughters Julie & Jenny were arriving as the surprise dinner guests. John was on a trip around the South Island with his girls and just seemed the perfect opportunity for us to have a wee get together. 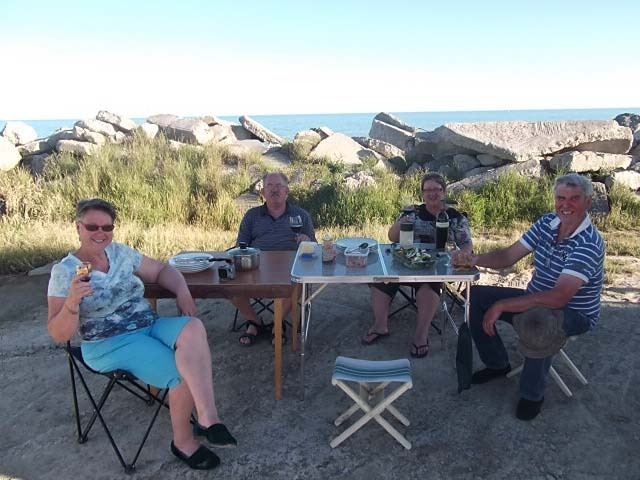 A great evening was had, before we all retired to our abodes at a reasonable hour as Mike & Ann had an early start in the morning heading off to specialist appointments in Dunedin. 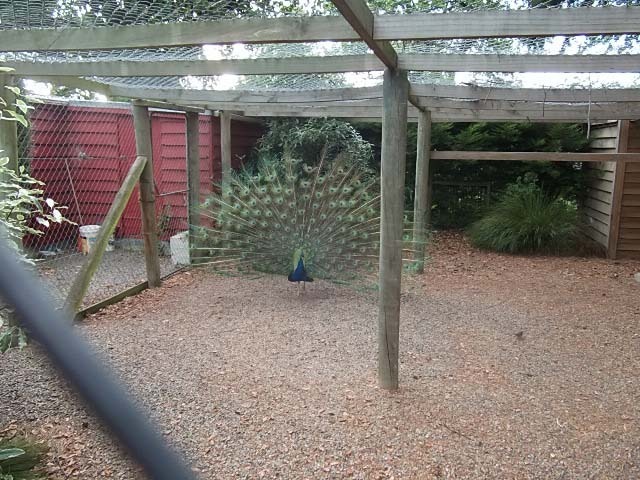 We spent the day around Oamaru, with John and the girls joining us for dinner and an evening of playing cards. Yes, Julie & Bernice reign as Sequence champs! Another day at the race course, John and the girls joined us again for dinner and more cards, this time Crib was the game of choice. Let us just say that the male member of the visiting party needs to hone up on his card playing skills! We also heard from Mike that the news of Ann from Dunedin was not good. We are all devastated. Off to Helen & Don’s for dinner tonight. Ann back in Dunedin hospital. A day spent around Oamaru, getting on with bits and pieces. 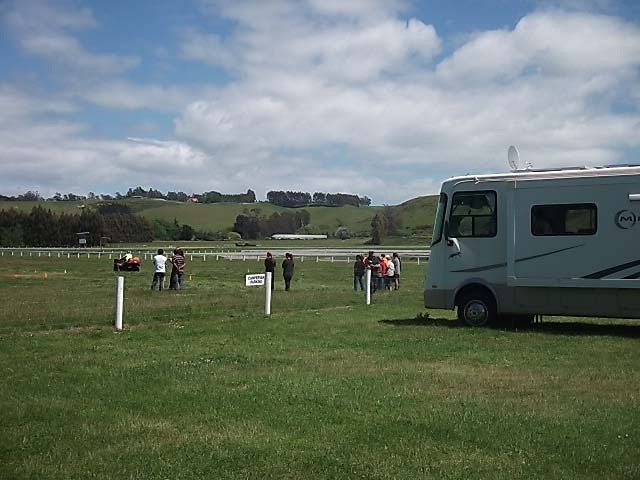 Off to Dunedin, we end up at the Wingatui Racecourse – what is it with us and Race courses? Off to see Ann. Roy’s greatgrandfather and his third wife had on many occasions in the 1880s and 1890s bid for and successfully obtained the rights to provide food and drink at this course on race days. 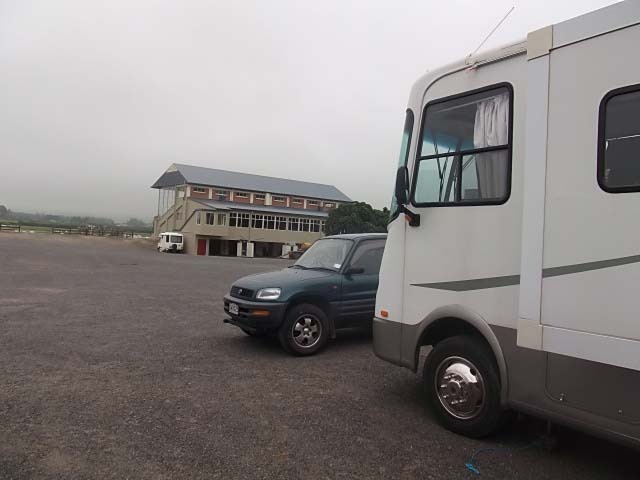 Decide to move form the race course, to the A&P showgrounds not too far away. Much nicer surrounds. Then off Christmas Shopping – yuck! Back up to see Ann, news worst possible. Deterioration over the last week has been huge. Emotions running through the gamut today. 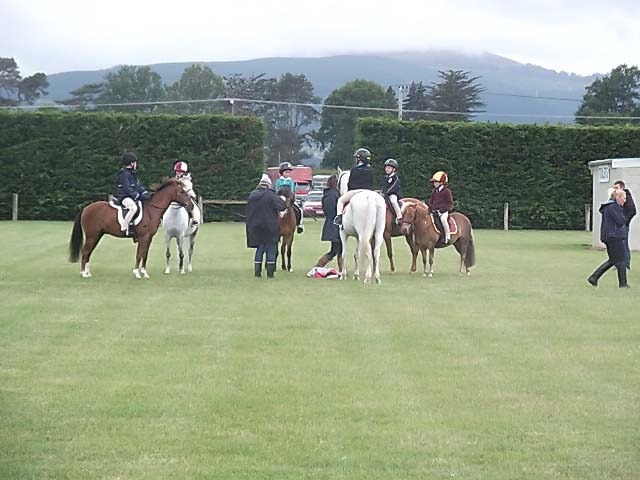 Budding Show Jumpers having their day in the field at the Showgrounds. The following week was spent visiting Ann, keeping an eye on Mike, Natalie & Stuart and doing what we could, which seemed to be very little and we have never felt so goddam useless. Ann was transferred to the Otago Community Hospice where she spent her last few days. She passed away in the early hours of Tuesday 20th December. To make me eat beetroot! There’s going to be number 3. But we will let your body go. With a heavy heart and much sadness, we can tell you all that our dear sister-in-law Ann died yesterday morning after a brief battle with cancer. Off into Temuka this morning to replenish a few essential items and also to get some info on the fishing regulations as they seem to differ slightly for each region. 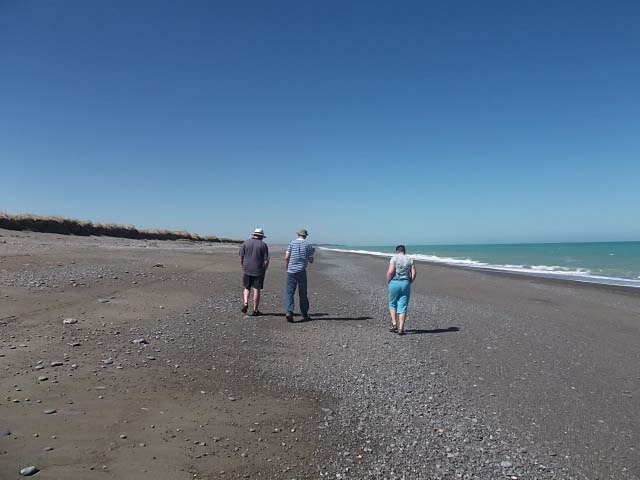 On the way back to the van we went for a slight detour to visit the Milford Fishing Huts and the beach. Back to Orari River Mouth, the rest of the day was spent wandering the beach and trying to keep out of the heat of the day. Summer seems to have well and truly arrived which means the purchase of some sunhats, suntan lotion and comfy outside chairs, the latter is a work in progress as not all chairs are created equal. Yet another glorious day, we could quite happily stay here for another week however we need to go and empty the waste tanks. 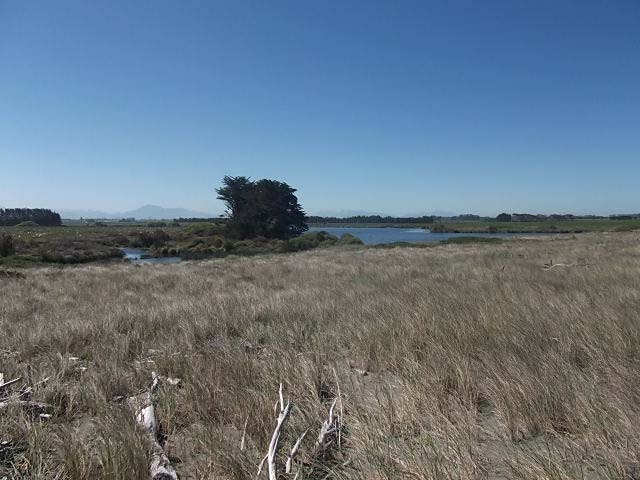 Our plans were to leave the river mouth, then head inland via Fairlie and Tekapo to eventually end up around Alexandra and Clyde where we left our travels a few weeks ago. 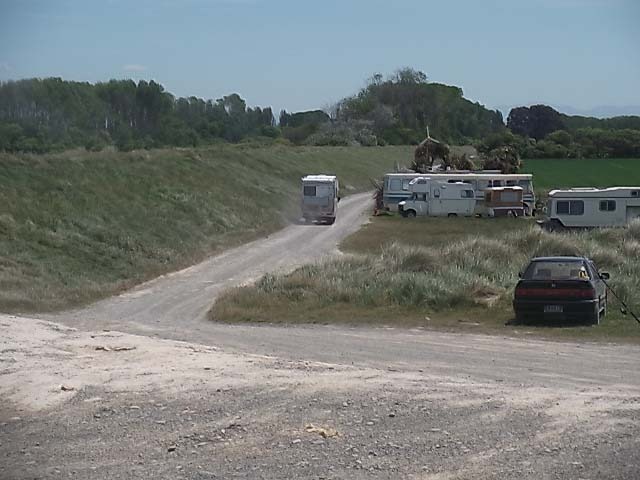 We headed off first into Temuka where there is a dump station at the Domain/camp however, there was no potable water available, well, in clear view in any case. 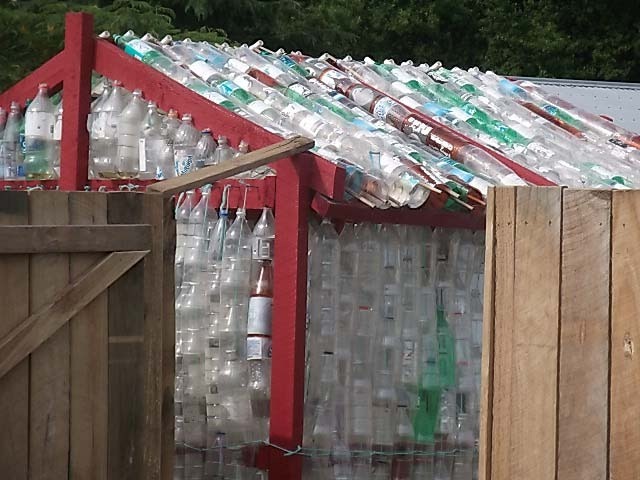 So instead we head for Timaru where we know there is a good waste station. 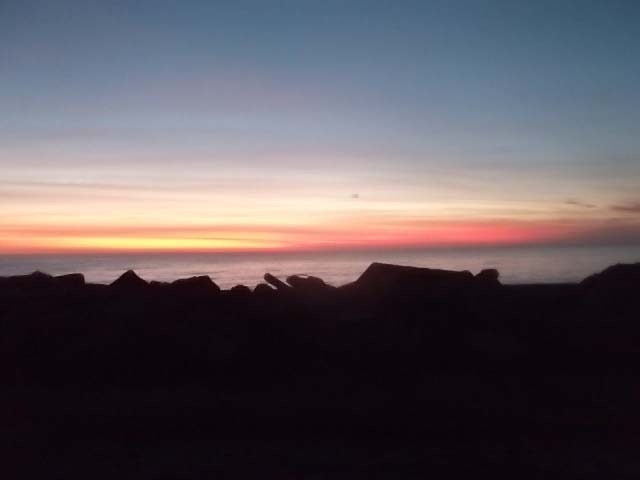 We also decide to take the opportunity of leaving the van at the waste station, unhook the RAV and head into Timaru to get the laundry done, and also to pick up a few things that we had forgotten the other day. Things such as a summer weight duvet, as the one that I had thought I had packed seems to have disappeared. And summer has arrived!!! Plans revised, instead of heading inland, we decide that it would be much more sensible to head down the coast as far as Palmerston and then head inland, plus it would be different route to the one we have already travelled in the van. 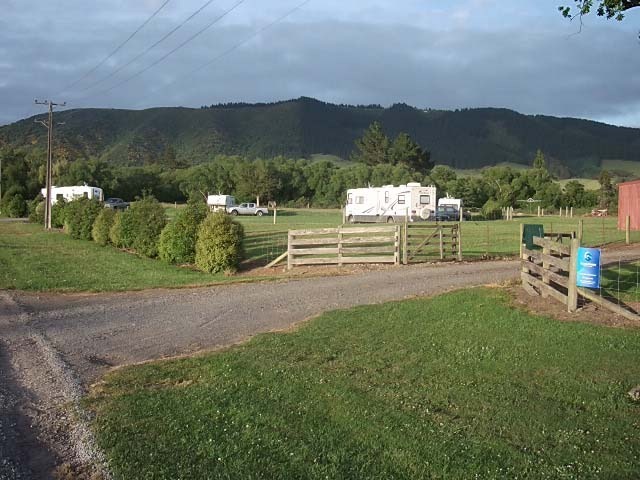 Out with maps and planning books, and we decide that Waimate would be a good spot to stay as the NZMCA have a parking spot there and it would also be a good opportunity to catch up with Anne & Paul. .
Off we head and soon arrive at the delightful parking spot and get ourselves organised. First things first, hang out the washing, get dinner underway then give Paul & Anne a call to arrange a get together to play a few games of cards and generally catch up. 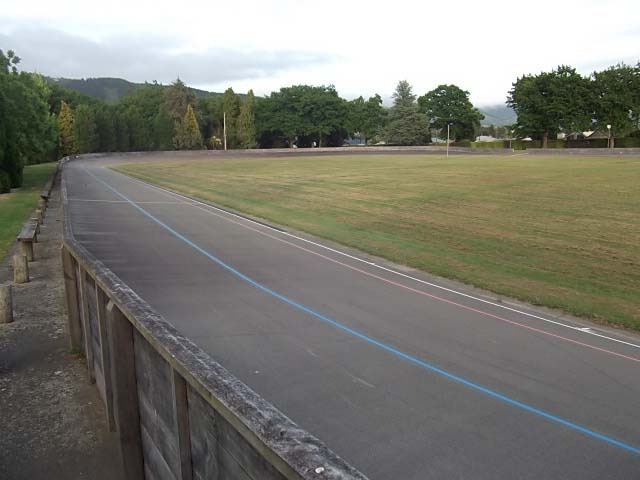 As well as the usual Bowling Green, Netball Courts, Tennis Courts and Children’s playground there is a very well maintained Velodrome. Part of the joy of staying at various places is the opportunity to see interesting things and make finds of everyday items that pertain to the area and also generate an interest in “found” items. The above photo shows three items found over the past couple of days when walking along the beach at Orari River mouth. 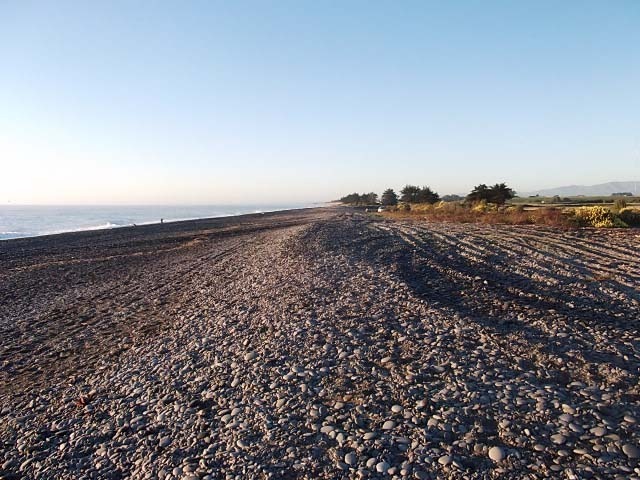 The beach itself is part of a very long shingle beach running from Timaru to the Rangitata River, interrupted by several smaller rivers including the Orari. There is little detritus at the tide mark but it is still interesting to find unusual (to me) items. 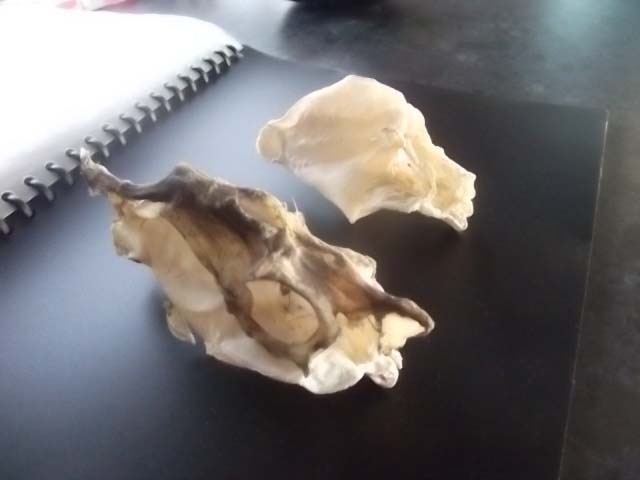 The item on the left was the first found. It is a hollow spine about 100mm long with a sharp point and a groove running the length of the concave side. If we had porcupines in New Zealand I would have thought it a spine from one. The right hand item is a spinal bone from (probably) a fish. This is obviously bone. 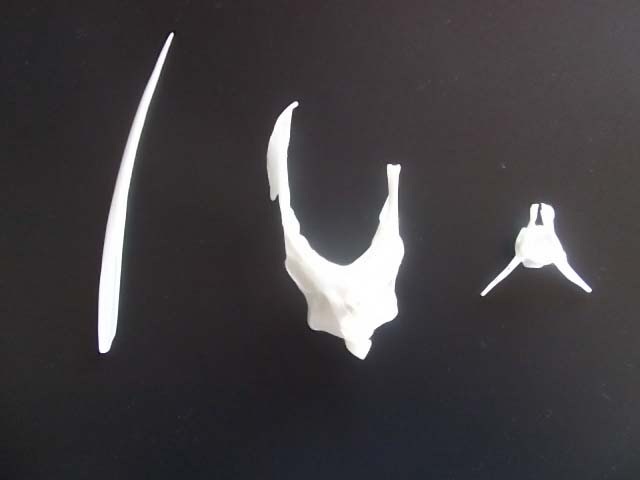 The middle item is again part of a skeleton but it is not the usual bone. It is in fact cartilaginous being slightly soft without an internal structure usual in bone. Now things get a little interesting. 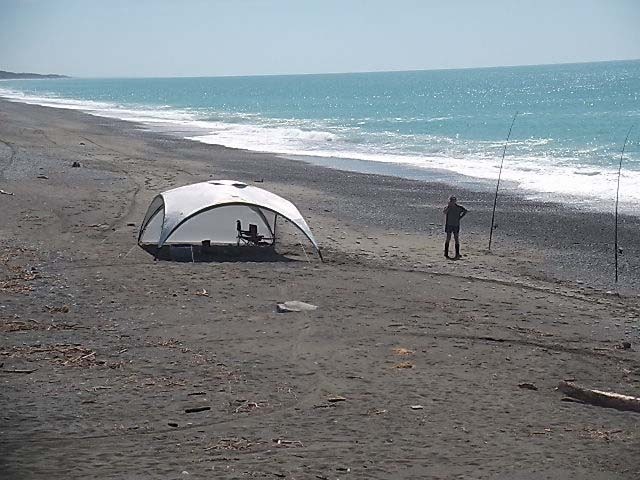 Talking to a local fisherman he told me that one of the fish caught off the beach was Elephant Fish and in passing he told of a friend that had caught one and had been stabbed through his gumboot into the bottom of his foot by the spine of the Elephant Fish. The foot had immediately started to swell and had to have the boot cut off. Apparently the spine contains or carries poison which is driven into the wound, causing swelling and pain. So the first “found item” may in fact be one of these spines. So onto the “interwebby thing” to find out about Elephant Fish, of which I had heard but only by name. It turns out the Elephant Fish is not a fish but is a shark and like all sharks has a cartilaginous skeleton. In fact because of this and the corollary that there are no bones makes it ideal for Fish and Chips. So it could be that the third cartilaginous “found item” could be part of an Elephant Fish. On our last morning a longer walk revealed two finds. Plans were made and everything was set. 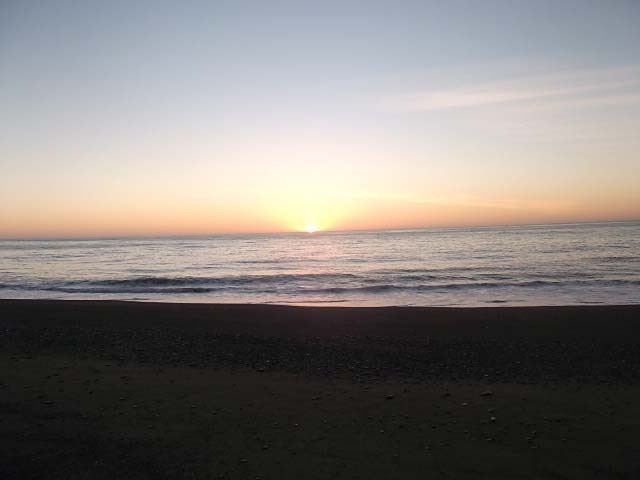 We were leaving Oamaru to resume our travels, but first we were off in opposite directions. 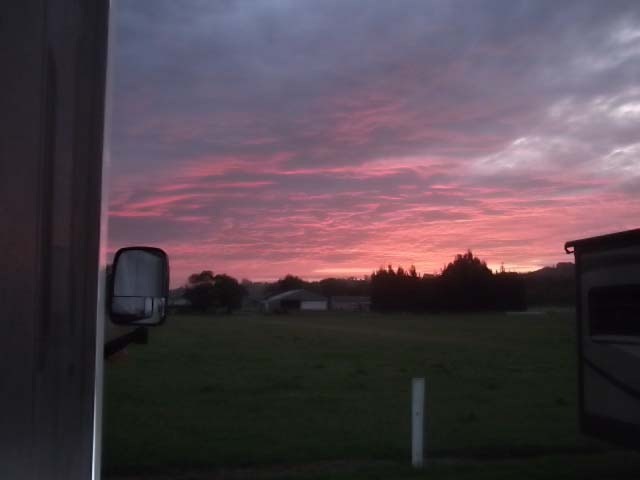 Bernice was up and off early this morning to take her Dad to Dunedin hospital for a scheduled appointment, with Roy heading in the opposite direction in the van to the first stop of the trip. For the next couple of days friends Helen & Don are accompanying us in their newly purchased campervan. Plans were for us all to meet up at St Andrews Golf Course later in the day. 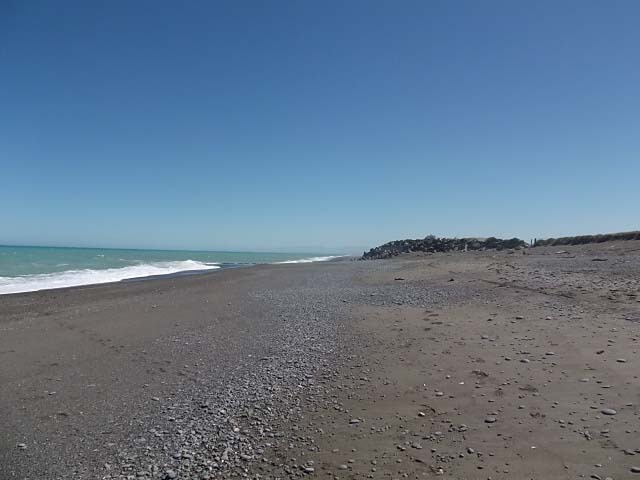 Not THE St Andrews of course, but the one just south of Timaru. 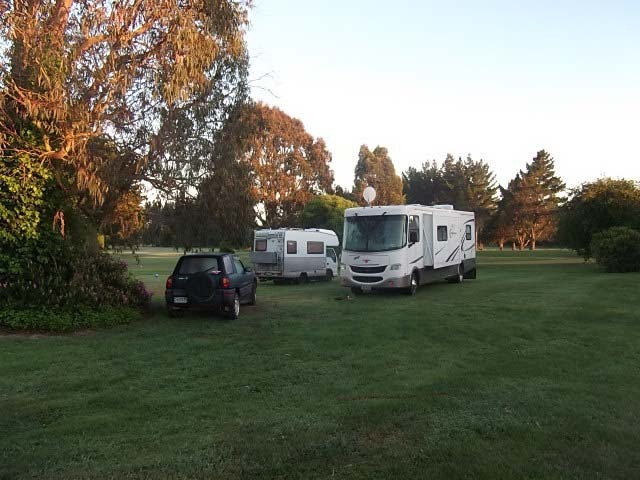 By late afternoon we had all arrived at the Golf Course, this parking spot was a little different to other clubs we had parked in as here we were directed to park on the grass whereas other clubs usually have us park in one corner of the car park. So here we were parked up at the front of the course surrounded by beautifully manicured grounds, large trees, and flowering rhodendrons. After a lovely dinner of fresh Blue Cod, we settled down to play cards for the evening, we introduced Helen & Don to the game of Sequence. A very pleasant evening was spent. An early morning stroll found the foreshore opposite the Golf Course. 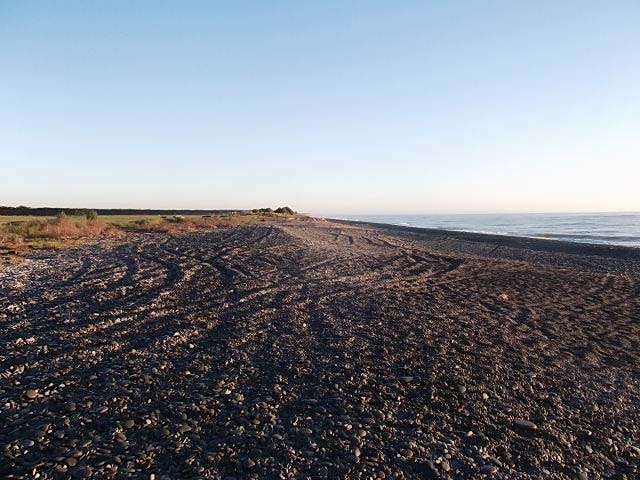 A typical stony beach stretching for miles (kilometres) north and south. There were a couple of fishermen out but not catching a lot. 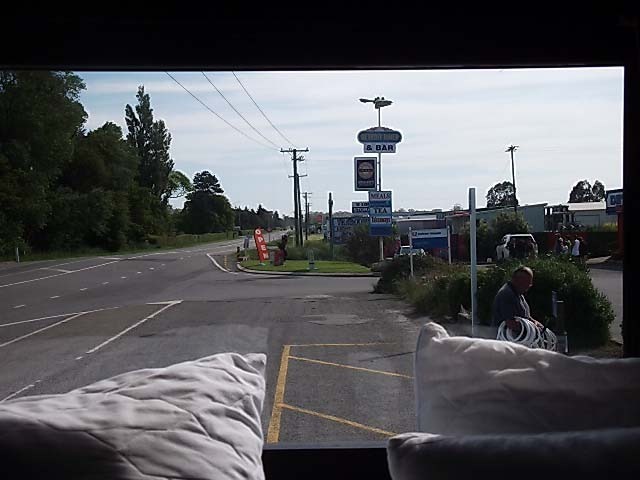 Off this morning and heading first to Timaru to get a bit of essential shopping done, particularly for Helen & Don as they needed such things as a kettle (to go on the gas hob). Then off to the next parking spot which we had planned which was the Orari River mouth. 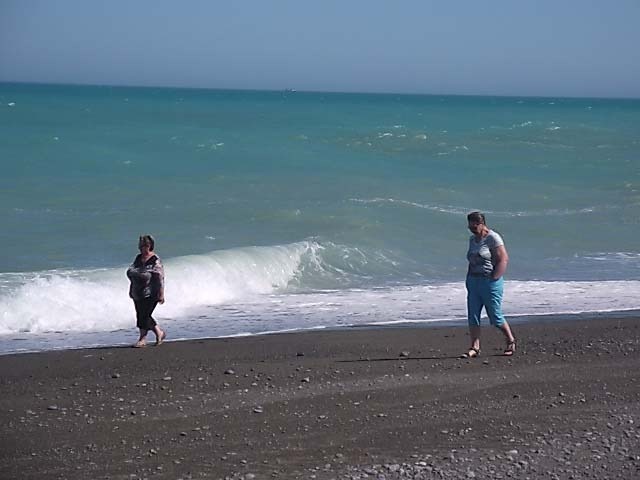 Bernice & Helen went ahead in the RAV with Don following along behind in their camper with Roy coming along sometime later after he had attended to a few chores in Timaru. Suitably parked just 20 metres from the sea, with not a cloud on the skies a late lunch was quickly set up outside in the glorious sunshine. This is the life! 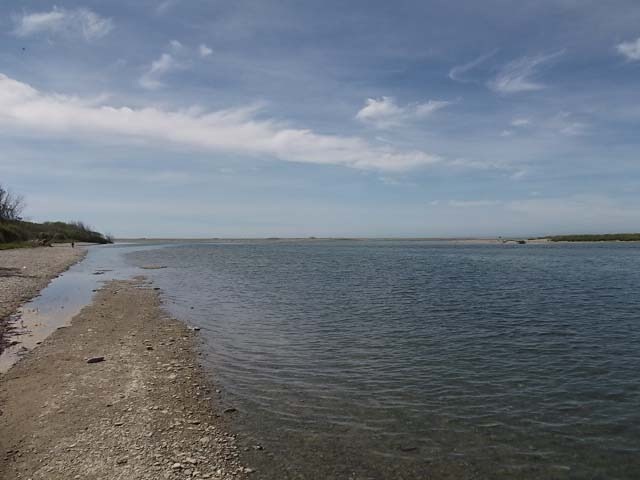 We subsequently set off for a stroll along the beach and the river. Flood gate on the side of the river. 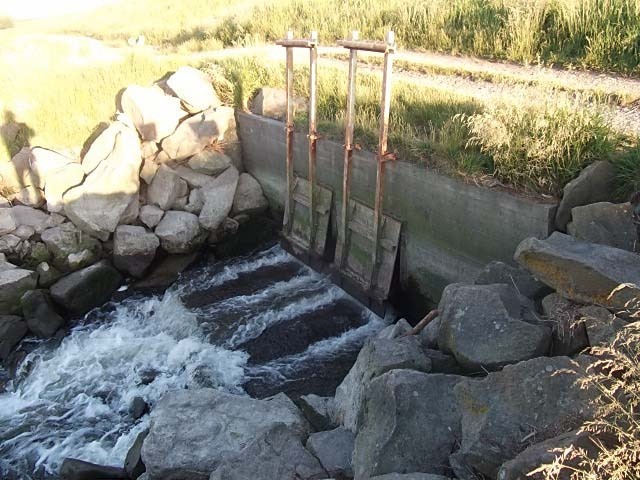 This floodgate is built into the side of the floodbank allowing a stream to flow into the river. It is counterbalanced so that as the river rises to the level of the bottom of the steel plates the water pressure generated presses against the plates and closes the plates (gates). At such time as the river level falls the floodgates will automatically open to allow water on the other side of the floodbank to flow into the river. Don & Helen wanted to try out their BBQ, so guess what was for dinner tonight? After the obligatory happy hour or two, we got on to cooking dinner. We must add here that the van cellar was replenished from the stock we had stored with Mike & Ann, so tonight’s dinner wine was a 1999 Waiheke Obsidian – and damn good it was too. Another lovely evening watching the sunset over the hills then off to bed. 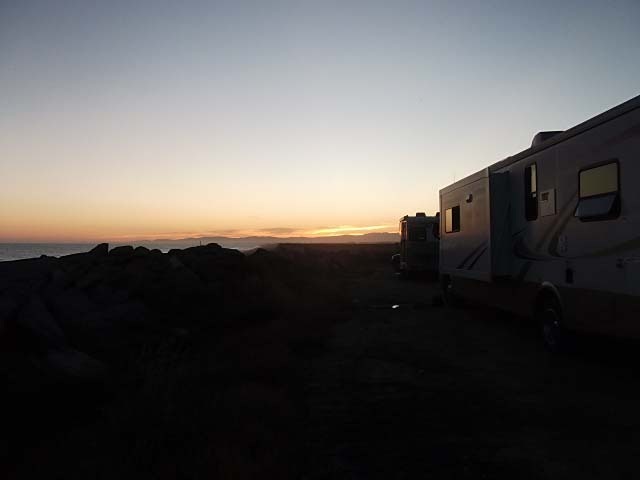 A relaxing start to the day with a few chores done, and things sorted with Helen & Don’s camper. Today there was a group of boys from one of the local High Schools out for a day of fishing in the river, surf casting and swimming in the river. 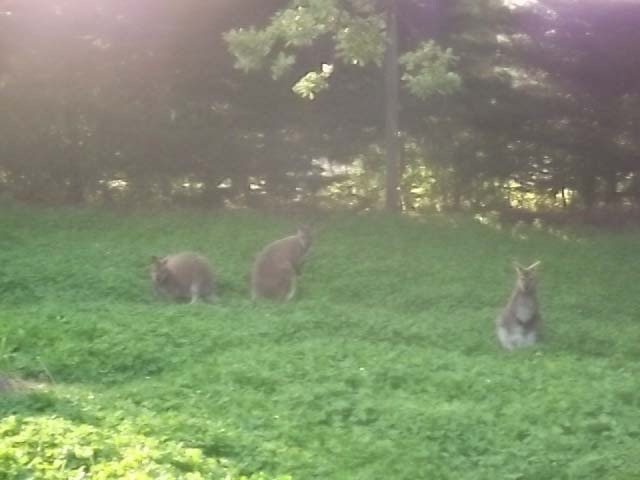 It was so nice to see them out and about enjoying the outdoors. We headed off for another stroll along the beach, collecting ‘treasures’ along the way. Back to the vans and time for lunch but first an interlude of watching a gent trying to land a large fish on the beach. After 1 1/2 hours the 7ft shark broke free to swim another day, but it did provide free entertainment for us all. 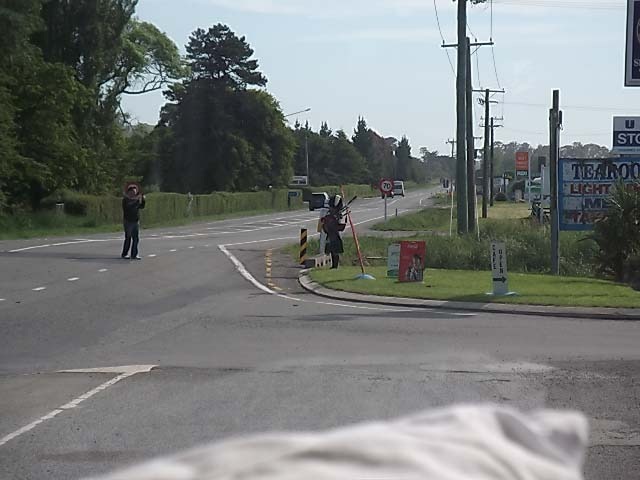 Mid afternoon and we bade farewell to Don & Helen, they were off to Waihi School where their son teaches and lives with his family. We spent the rest of the afternoon catching up on things like this blog, getting accounts sorted, and invoices ready for posting, before settling down for a quiet evening. Before the beginning by Martin Rees a book about the beginning of the universe, covering both the very large Cosmic picture as well as the very small sub atomic particles. A brief history of Astronomical advances with the last few chapters giving an insight to the latest speculation regarding pre Big Bang and the end of the Universe. The Lighter Side of Gravity by Jayant V Nalika a book about the history of the theories and speculation regarding Gravity from Pre Newtonian Physics through Newtonian Gravity to Einstein’s theory of General Relativity to Black Holes and Time Warps including Hawking’s theories of Black Hole evaporation. We have been back in Oamaru for two weeks, for family reasons we shall not get into here. But whilst here we have been able to get a few minor jobs completed and ticked off the list. The major one was getting a cabinet built and installed in the van to house the printer. Again, Steve from Inex Interiors came up trumps and had one built in no time. It has a couple of extra drawers in it, which makes it tall enough to double as a side table. We also had another few minor tweaks completed with other bits and pieces so we should be reasonably set up now (fingers crossed). 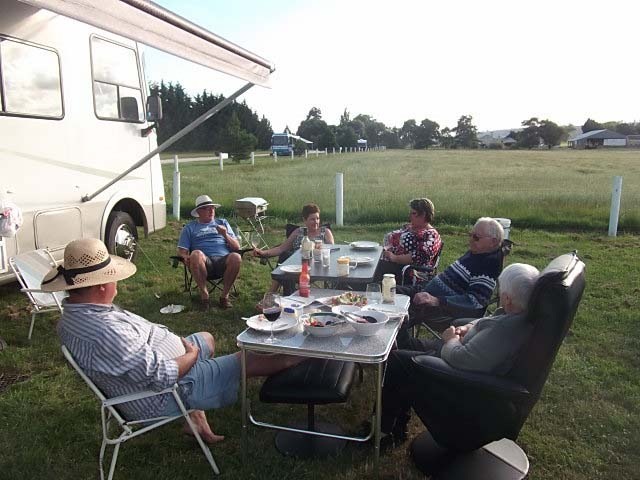 Friday 25th (Bernice’s Birthday), we had a couple of fellow motorhomers in for drinkies – Marty & Carol and Amanda & Chris, plus Mike & Ann and friends Helen & Don (who came in their recently purchased camper). 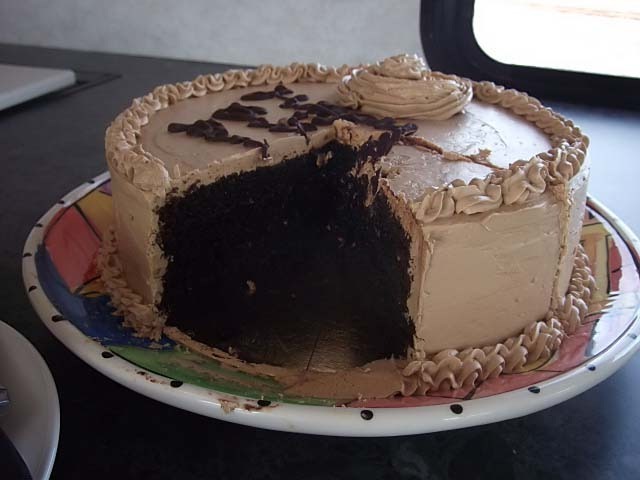 We managed to seat 10 of us comfortably in our van, and a very pleasant evening was had by all. Let us just say that Happy Hour extended over a many hours and our wine cellar got a serious hammering! 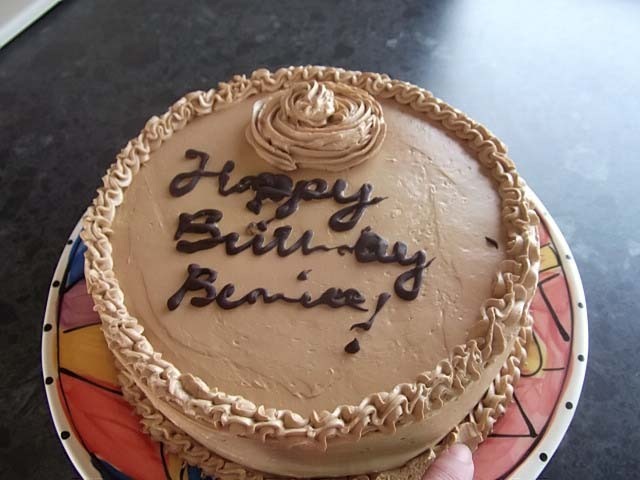 James & James made Bernice this stunning birthday cake which was just divine, and we even managed to share a little of it! 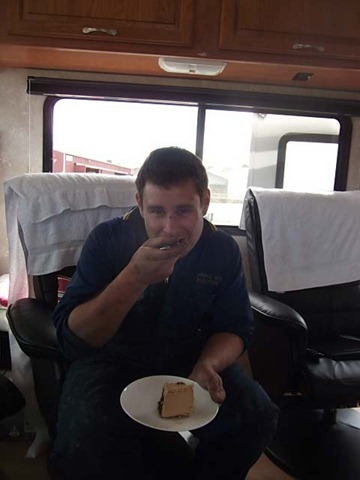 …… Timmy enjoying a piece of cake after he fixed the Hydraulic Jacks! 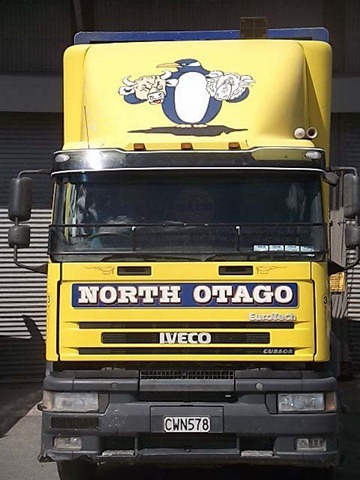 Yes, the jacks were not really fixed after our efforts in Balclutha to get them sorted, they stopped working again. However, Tim (Bank’s Auto Electrical) found the fault and promptly got it repaired. He deserved that piece of cake! View out of the back window of a Piper in full Highland dress playing the bagpipes as we do our thing at the waste dump! A closer view of the Piper. 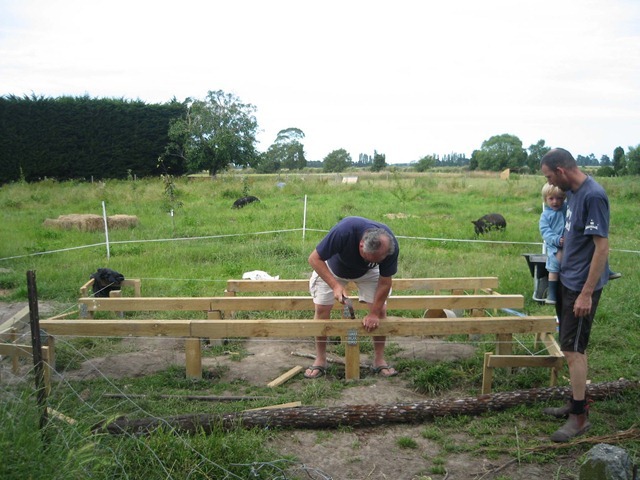 We have also had our mishaps….like a water leak into the rear locker and bedroom, one of the arms for the bed raiser coming undone, and …………………….. But to compensate, we have met some lovely people whilst being parked up here, many of them fellow full-timers (there are a LOT of us) as well as part timers. 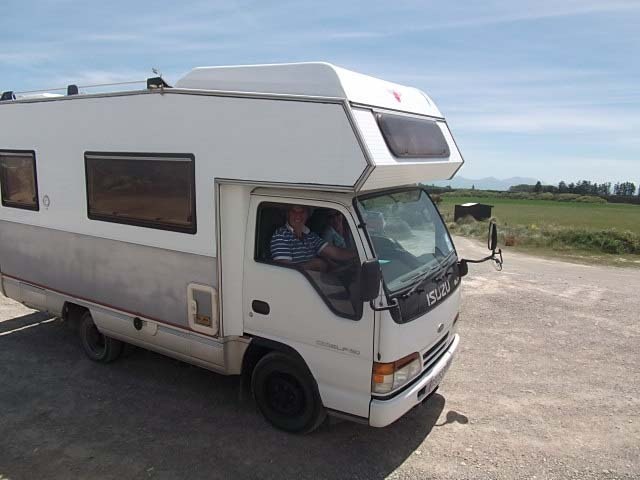 We are now back on the road again for the next few weeks before we make our way back through Oamaru to catch up with family before Christmas, then we are into Eiffelton (just out of Ashburton) to spend Christmas with Jason, Erica and the grandchildren. This is something we are really looking forward to.